Constructed in 1908 as a four-room schoolhouse known as the Union Academy, the Cope Building sits in the center of the Mullica Hill National Register District in Harrison Township, Gloucester County. The Colonial Revival-style schoolhouse was built as a response to the growth of Mullica Hill, as the rural farming community became a successful agricultural produce shipping center in the late 19th and early 20th century. This stately building served as a school until 1951, when it was sold and hosted such varying uses as a sewing factory, warehouse, and a boat-building facility. 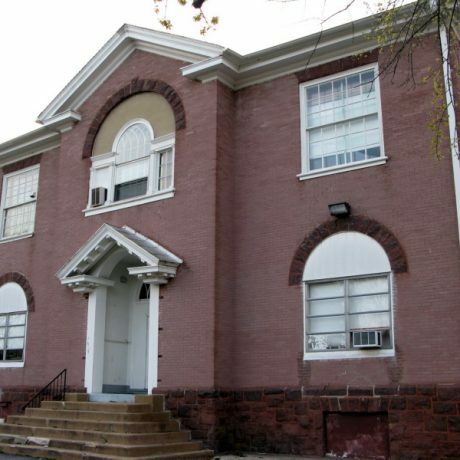 The Friends School Corporation acquired the building in 1969 and returned it to its original use as a school, renaming it the Cope Building after a trustee of the Corporation. The building is no longer being used by the Friends School and has been vacant and deteriorating for several years. The Friends School has applied to demolish the building, claiming that it is structurally unsound and that restoration is cost-prohibitive. A 2001 structural assessment of the building by an engineering firm found that while there were some underlying structural issues that needed to be addressed due to lack of maintenance, the building was generally in sound condition and not in danger of imminent failure. The demolition permit application has been denied by the Harrison Township Historic Preservation Commission, but it is not clear at this time if the Friends School Corporation will appeal the decision to the township governing body, in an attempt to proceed with its plans to demolish the building. If successful, the Friends School Corporation plans to retain the current site of the school as a vacant lot. The loss of this building would prove to be a significant loss to the integrity of the National and State Register-listed Mullica Hill Historic District. The Cope Building is only one of scores of historic schoolhouses throughout the state that are facing a questionable future. But schoolhouses are ideal candidates for rehabilitation, and should be seen as such. The history of the Cope Building already includes a diversity of uses for this versatile structure: PNJ encourages the pursuit of a buyer or donor’s assistance in the creation of a plan that recognizes that the Cope Building could easily lend itself to any number of adaptive use scenarios.